Ever find one of your old systems and controllers buried in your garage, covered in years of dust and funk? Have you bought a used controller and realized how unbelievably gross it is? Well, don’t worry, I have the perfect solution for you that can make almost any old system or controller look new again!!! – Tools to open your console (most of the time you just need basic screwdrivers, but SNES and N64 require this tool). – Kitchen brush with plastic bristles, not metal! 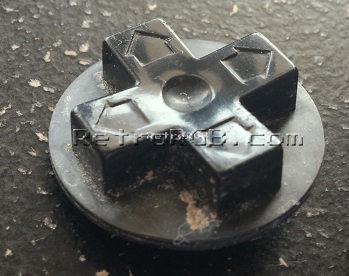 – A video game console or controller that’s had all of the metal and electronics removed. First, make sure your console or controller has had every bit of metal or electronics removed!!!! Seriously, unbolt and remove everything. 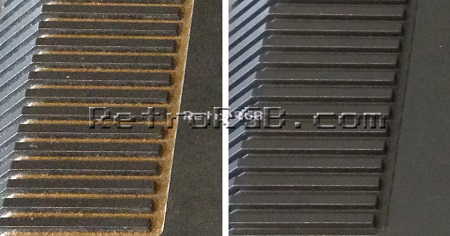 Spray all of the electronic components with compressed air. This is one of the few chances you’ll probably have to get the electronics clean and the less dust that’s covering them, the cooler the components will run. Also, an important tip: Make sure your sink drain is closed when working on controllers…you wouldn’t want to lose any small controller parts down the drain! Splash a little bit of water around the GooGone. Use the plastic bristled brush and thoroughly scrub the entire console or controller for as long as it takes to get clean. 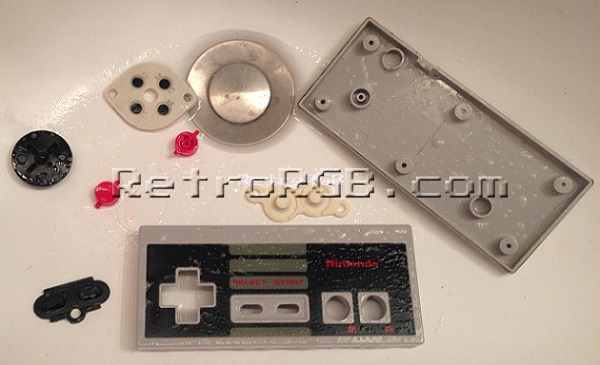 – Clean all individual pieces as well, such as controller buttons, expansion doors, etc. – Do not scrub over any labels, just around them. – Add water and more GooGone as needed. 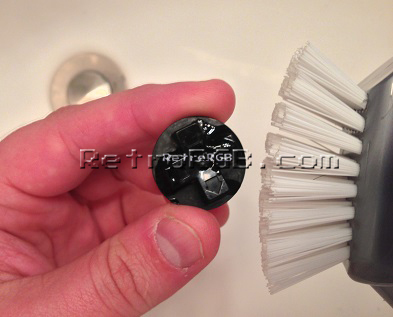 – If needed, spray some GooGone on a Q-tip to get in tight areas, like the holes in the controller where the buttons sit. Wash off as much as the GooGone as you can. – Try your best not to soak the labels, but they will get wet. Squirt some dish detergent and scrub once again, making sure to get a good lather and scrub every bit of your system or controller (that’s not a label). – The purpose of the dish detergent is to clean off the slippery residue that the GooGone leaves behind, as well as clean any remaining dirt out. Once again, wash off the console and make sure you get all of the soap out. Shake off the excess water. Dab (not rub) the labels with a towel. – You should dry the labels as quickly as possible, so they don’t get discolored. Use compressed air to get the water out of hard to reach spots. Leave everything to dry for at least a few hours. – I usually repeat the last few steps every hour or so to speed things along: shake excess water, spray with compressed air, dry labels with towel. The controller cords and connector at the end usually get really dirty as well. – Spray a little bit of GooGone on a paper towel to clean the cord and connector. 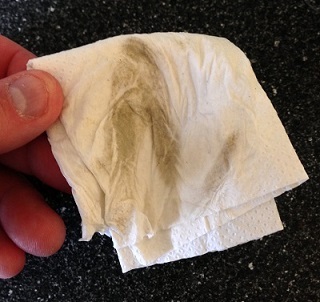 – Repeat the process with a bit of water (or maybe Windex or something) on the towel to get the GooGone off. After everything is completely dry, re-assemble it and enjoy your “brand new” console or controller! I posted a video of the whole process if anyone wants to see it for themselves. 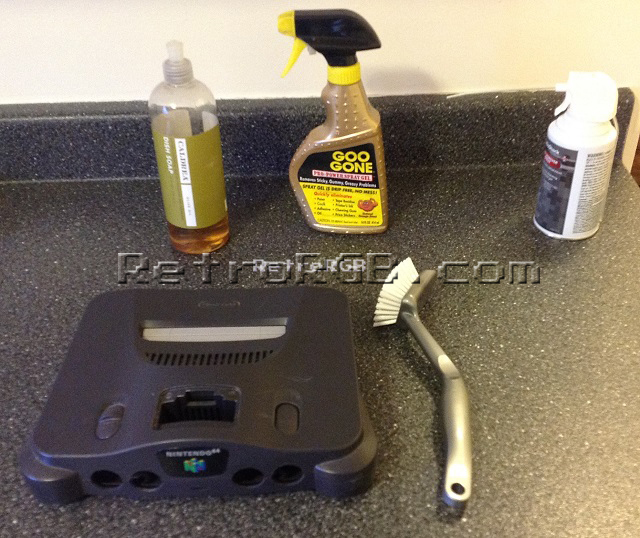 Since you have the console apart, why not take this opportunity to clean the cartridge inputs? I strongly recommend that everyone follw this guide with all their old systems! !